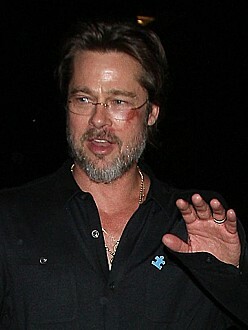 Brad Pitt bruised his face falling over in flip-flops. The Tree of Life actor stepped out at the Light Up the Blues Concert in Hollywood for autism on Saturday with a huge mark across his face, and it has now emerged he sustained the injury after taking a late-night tumble in poor footwear. ”Regardless, I wasn’t going to miss the Autism Speaks benefit the night after – wonderful people and I was honoured to be a part of this important event,” said Brad. During the evening, Brad – who raises children Maddox, 13, Pax, 11, Zahara, 10, Shiloh, eight, and six-year-old twins Knox and Vivienne with wife Angelina Jolie – won a bidding war to take home a guitar signed by all the event’s performers. He paid $23,000 for the instrument. Other celebrities in attendance at the concert – where all the performers were autistic – at the Pantages Theatre included Christina Applegate, Gary Cole and Amy Brenneman, while Jack Black was the evening’s host.